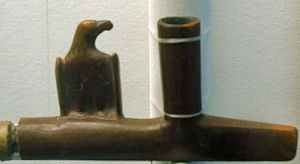 The ceremonial use of the pipe is a simple ritual, it serves as a portable altar. It is filled with tobacco or a blend of tobacco and wild plants called kinnic kinnic, which is the bark of the red willow and non-hallucinatory. The bark of the red willow has a pleasant aroma, and served in the old days as a substitute, when tobacco was scarce on the Great Plains. No form of mind-altering substance is condoned by Native American religion traditionalists. Unfortunately, peyote, a mind altering cactus bud , is wrongfully associated with traditional Native American religion and ceremony. 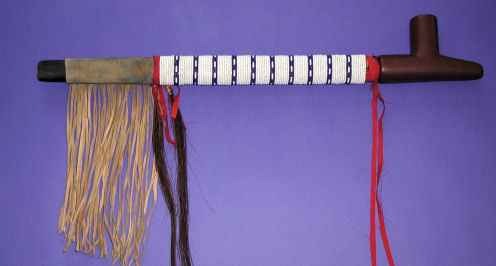 The True Native American Way finds the Great Spirit through "our own juices" (fasting, knowledge and observances of God's creation and the Sun Dance, Vision Quest, and Sweat Lodge ceremonies). We do not need or use hallucinating substances. 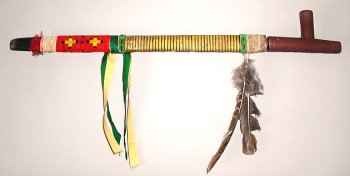 The pipe ceremony begins with loading tobacco into a pipe and then acknowledging the four directions, Mother Earth, and Father Sky; it culminates with the final offering to the Great Spirit. The pipe is held firmly by the bowl in the palm of the hand with the stem pointed outward. 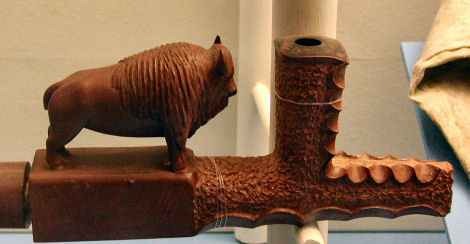 The last step of the pipe offering is the holding up of the pipe with its stem pointed straight upward, out into the Center of the universe.